KC taking exception to a Liberty score. QB Derrick Bernard scored 7 touchdowns on the night. 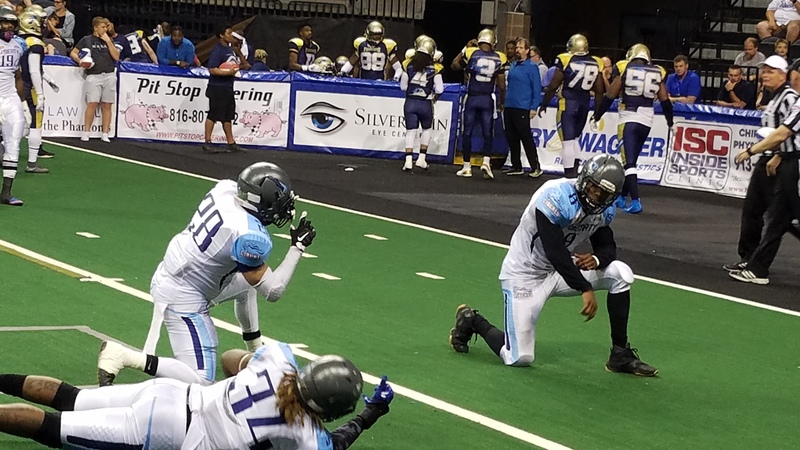 With a chance to win the North Division in Champions Indoor Football, the Salina Liberty hit the road on Saturday to visit the Kansas City Phantoms. The Liberty not only had a chance to win the division, but also could start the playoffs at home next Saturday. Both teams scored on their opening drives and a Jimmy Allen extra point was the difference early as the Liberty took an early 7-6 lead. On the Phantom’s second possession, Liberty defensive back Eric Johnson grabbed an interception and Salina was able to convert that takeaway into another touchdown with a Derrick Bernard rushing score. At the end of the opening quarter, Salina led 14-6. To start the second quarter, the Liberty defense served up a couple more turnovers led by an interception from Isiah Barfield. 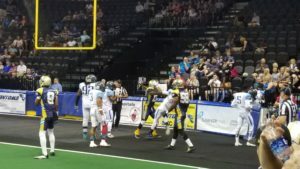 Tracy Brooks would notch a rushing touchdown after a long carry from Dominique Carson. The point after touchdown was a 2-point conversion pass from Derrick Bernard to Ricky Wyatt. On the next drive for the Liberty, Bernard would find Donovan Raspberry in the back of the end zone for his first touchdown of the night making the score 28-6 with 5:00 left in the second quarter. After a botched field goal attempt for Kansas City, Salina would score on a two play drive capped by a Derrick Bernard touchdown run where he went airborne ending up in the first row of the audience. Extra point by Jimmy Allen continued a 35-0 Liberty scoring run, making the score 35-6. Salina would start the second half with the football and put together a scoring drive that lasted almost six minutes. Derrick Bernard would score his third rushing touchdown of the night that was capped by a Jimmy Allen on the extra point. Salina extends their lead to 49-6. On the next defensive possession, the Liberty would collect a safety and get the ball back for the Liberty offense. On the ensuing drive, Rashad Pargo would dive into the end zone from the five yard line for a rushing touchdown. Allen added the extra point and the Liberty led 58-6 at the end of the third quarter. The Phantoms would end the scoring drought with 13:25 left to play as they scored on a screen pass to Marquel White. The 2 point conversion would pass would be successful as Kansas City made the score, 58-14. Salina would answer quickly on a big kick return by Tracy Brooks and an one play drive. Derrick Bernard found Rashad Pargo in the back of the end zone for his third touchdown of the game. Allen’s extra point kick would put the Liberty in the lead further, 65-14. The two teams would trade touchdowns to end the game and the Liberty take the victory, 72-20. With the win, Salina finishes the regular season with 9 wins and 3 losses. The Liberty also clinch the North Conference title and will host a first round playoff game next weekend at Tony’s Pizza Event Center. Opponent and date to be announced on Sunday evening.